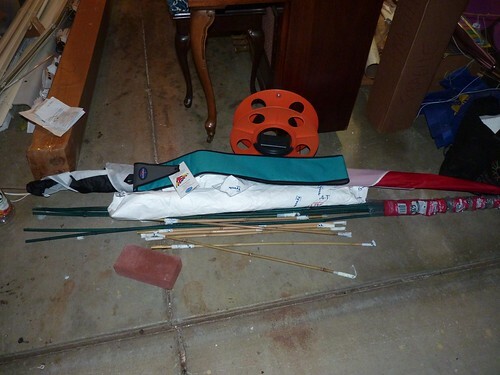 The goal: to build a low-wind kite that's easy to build and costs less than $10 in materials. This details my work as well as Pat Coyle's on kite construction, and the rationale of the delta as a kit kite. 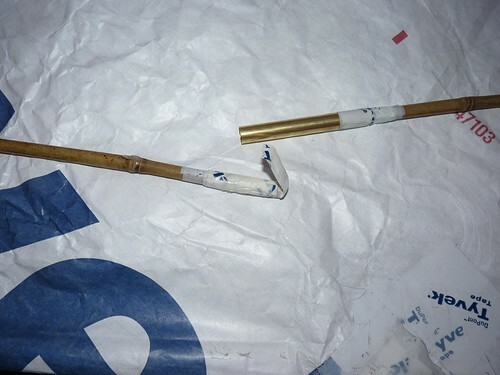 After experimenting with the Fled kite design in bamboo and tyvek, it became clear that splitting and preparing bamboo spars was not an easy enough task for a simple kit designed for all skill levels. The 209cm bowed spar is too big to take on an bus, train, or airplane, limiting the kite's utility when traveling, and the twin keels and drogue tail construction required precision and time, also limiting its attractiveness to beginners. Bowed kites are the best low-wind performers, but deltas do fairly well and the delta design solves the problems of portability and construction difficulty. Deltas fly well without tails or with only very simple tails, have a single keel, and a 3 meter kite can be built with whole, unsplit bamboo culms less than 150cm long and only 1cm (3/8-1/2") diameter. This last feature is the most crucial for portability, as the kite can then pack down into a 60" (152cm) mailer tube, the longest object allowed in an airplane overhead bin, and the longest size the post office will mail before incurring extra fees. I already own a kite which fits this description-- the 9ft Levitation Delta from Into The Wind, purchased from Brooks Leffler. It is a dream to fly and travel with. No hassle, well built, and since all the spars except the spreader are the same length, really easy to assemble. 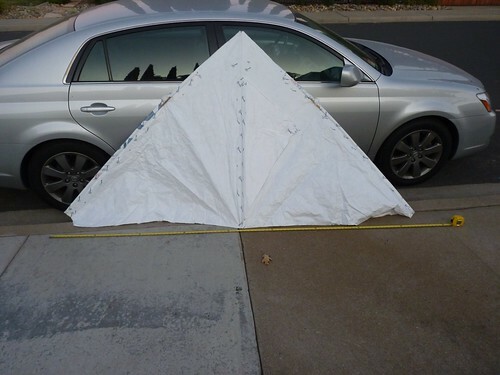 I decided that since I owned it, copying it and watching how my kites flew was the best way to learn kite construction. I've now built four deltas patterned after the Levitation--three with split bamboo and one with whole culms. The first bamboo and tyvek delta was patterned out with Todd Hunkler, and built to match the stiffness of the Into the Wind's Levitation. With 1/4 culm pieces 1" wide, it came in at 2lb 4oz (1kg) and wouldn't lift in lighter winds. I immediately built a second with the same pattern, but with bamboo spars split to 1/8ths culm, making about 1/2" (12.7mm) square cross section. The kite only weighed 1lb 6oz, but "flapped" when a gust would hit it, curling the spars upwards. Wary, I flew it with two 8' long tails. This was not only dynamic and beautiful, but also served to lower the kite's surface area and thereby reduce its pull, making the bamboo Levitation far easier to pull in than the Into The Wind Levitation in 12-15mph winds. Unfortunately, with a camera attached, this bouncing and flexing behavior would always set up a cyclical, pendular motion with the camera and kite swinging back and forth, the kite threatening to dive. next design steps I went to KitePlans.org and started browsing delta plans... much more to come.